The winner of the People's Choice Award (overall) was the Lebanese film Where Do We Go Now?, directed by and starring Nadine Labaki, who was traveling in Europe when she heard the news. Toronto 2011 in 60 Seconds: After-Party Glow, Two Reviews, One Trailer, and "A Very Naked Festival"
@LadySnarksalot: "Another great year for #TIFF11 and I really liked 12/14 movies!! 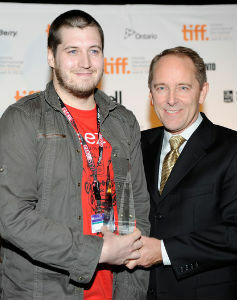 But, I really need a vacation now…"
@MMBris: "Had an amazing time at #TIFF11, can't wait to volunteer next year! Going to miss everyone I worked with at the #AGO." @rachel_is_here: "'Uncle Marv will appear for the last time' says the Donald Sutherland look-alike next to me. This is the end of #TIFF11." @katarinag: "Although I do realize that it's kind of twisted, recovering from TIFF by going to a movie."